Last night, while a meatloaf roasted in my oven and I moved some kale around a pan, it suddenly dawned on me that nothing in my life more resembles a video game than cooking. If somebody had cut out the time between 9 and 10 p.m. yesterday, when I shopped for, prepared and cooked dinner, and ran it through some mysterious black box of gamification, it would land on Steam as a resource-management/real-time strategy game. And yet, yesterday in Kotaku’s New York office, the creator of upcoming cooking game Battle Chef Brigade was not shy about the behemoth design challenges his team faced nailing down the essence of cooking without getting too bogged down in the particulars. Its premise, from what I saw of the demo, is very Iron Chef. Mina, a scrappy Chinese chef who tends to oversleep, must impress famous judges with improvised meals she makes under a time crunch. But her chef knife doubles as a hunting blade—she scavenges the ingredients herself, taking down animal critters and harvesting plants that might curry the judges’ favor. It will be out on PC, Switch and PS4 this winter. The actual cooking part is quite abstract: Players construct and solve match-three puzzles based on ingredients’ flavor profiles, which are represented by colors. So, if a judge wants a “Fire” dish, Mina can cook up a bull meat noodle stew with some hand-chopped Little Shop of Horror plants by arranging their flavor profiles, represented as sets of colored circles, in a puzzle and combining similar tastes. Designing Battle Chef Brigade’s cooking play also presented serious complexity challenges, like the pie paradox—how could the game be designed to distinguish between quiche, pizza, and pie (which itself could be savory or fruit, covered or uncovered)? “How detailed do you want your dough system to be? Do you literally add salt and sugar to it and different kinds of butter? How long do you spend rolling out the dough and folding it over? Can you make pastry that way?” he asked. A system in which any of those dishes is possible would be grueling to architect and potentially alienating to players who don’t cook, the team concluded. “It was really easy to make a mistake if you didn’t remember the exact order of operations for, say, lasagna,” Eastman said. Backing off from recipe-centric cooking also gave Battle Chef Brigade more of a by-the-seat-of-your-pants feel, something the team knew they wanted after watching lots of Food Network’s highly improvisational, tight-time-limit show Chopped. Prior to this discussion, it never occurred to me that, if cooking reality shows were a game, they would be a series of fast-moving puzzles that I thought up and solved—and not the steadier real-time strategy game that was last night’s dinner. In practice, the model felt true-to-form, stimulating the same sensations I get when I’m free-flow designing the best possible meal out of whatever the hell is around. So, I did not add noodles to the noodle dish Mina concocted to impress her first judge, who craved a red-flavored dish. But because Mina is a Chinese chef, and my first ingredient led with red flavor, the dish that came out—despite me adding jerky, eggs and plants—was a hefty bull noodle stew. To rack up enough points from the judge, though, I needed those extra ingredients—and I needed to match them with others—to make the dish more interesting. 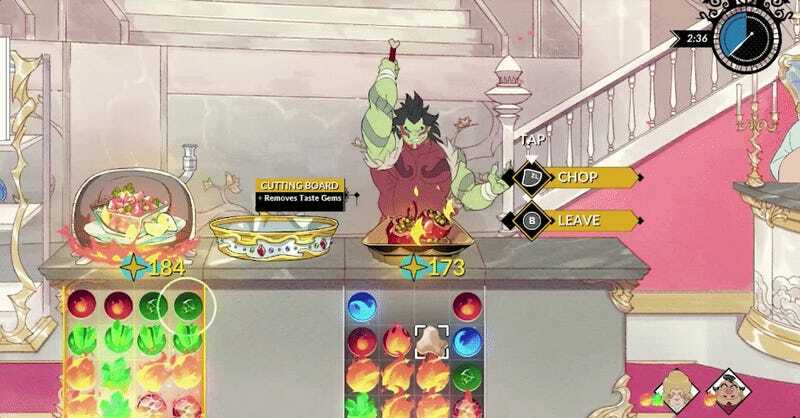 Battle Chef Brigade does some very clever things with its simple idea to mimic the thought processes that go into improvised cooking. Sauces can re-color ingredients to match others. A chopping block lets players cut out parts of ingredients they don’t want. When cooking up my noodle dish, I threw everything into a fire pot, which made the match-three conditions for the color red into match-two. It feels like cooking, even if it’s abstracted beyond realism. And that might have saved its bacon. “If you have to know how to really cook to play a game about cooking, it’s too much,” Eastman said.